Studying isn’t what it used to be. Academic competition is fierce, and schools expect a lot more out of their students. Coupled with the economic recession, over 70% of college students are working part time (1), averaging 30 hours per week, while maintaining their studies. With such limited time, how you study has become nearly as important as what you are studying. In order to maximize your time, energy and focus, many are turning to nootropics. But what are the best nootropics for studying? Most degree and diploma programs can be categorized under one of two categories: logical learning or creative thinking. Those studying economics, mathematics or the sciences would fall under logic based and would benefit from Oxiracetam. Oxiracetam increases left brain functionality, which is responsible for processing logic, analysis and facts, to name a few characteristics. In effect, oxiracetam would promoting logic-based thinking and help you understand number based concepts easier. How much Oxiracetam should I take? The recommended dosage of Oxiracetam ranges between 1200-2400 mg daily. For best results you would split this into three even dosages — for example 400 mg taken 3 times daily. It is always best to use the smallest dosage to see how it affects your body before increasing it. Similar to other nootropics in the racetam family it affects both the acetylcholine and cholinergic systems in your brain to improve everything from your attention span and memory to sensory perception. Containing stimulant properties, oxiracetam will also help keep you alert and focused as you study. If you are studying in the field of literature, philosophy or the arts, you would be considered more creative and want to use a nootropic that targeted your right brain functionality. Aniracetam triggers your right brain which is characterized by creativity, imagination, the non-verbal and feelings. When taken, aniracetam reduces stress and anxiety, boosts your mood, and allows ideas to flow more freely, which increases your ability to think abstractly. How much Aniracetam should I take? The recommended dosage of Aniracetam varies between 750-1500 mg. Start with the lowest recommended dosage to see how it affects your body and mind first. It has been noted that taking any less than 750 mg and you will not likely experience any of its effects or benefits. It is not fully known how Aniracetam works, but what studies have found so far is that it helps protect the brain from negative effects of having a lower oxygen supply. It does this by motivating receptors in the brain to take in more oxygen and glucose. To use aniracetam for studying, stack with Oxiracetam. Together you will experience improved verbal and linguistic functioning, as well as improved sensory perception and logical ability. Struggling to stay focused on the task at hand or even find motivation to study in the first place? L-Theanine can help. L-Theanine is an amino acid that has been found to improve energy levels, while reducing the negative effects of stress. Originally found and isolated from Green Tea in 1949, studies now show that it is an effective aid for enhancing focus and supporting brain health. The recommended daily dose of L-theanine is 200 mg, though it is common to find supplement brands on the market with 250 mg dosages. It is easily absorbed into the bloodstream and works by targeting the neurotransmitters responsible for affecting cognitive processes, such as dopamine, serotonin, GABA and norepinephrine — all of which improve focus by putting you in a meditative, relaxed state. To use L-theanine for studying, many students find it beneficial to couple it with a stimulant like caffeine. Separately these two supplements have their own negative side effects. For example, some people have found that L-theanine induces too much of a trance-like state, and caffeine alone causes uncomfortable jitter-like side effects. Together these two supplements complement one another nicely, by removing the negative side effects and giving you a clean, controlled focus for studying. Get the right motivation and focus for studying or preparing for exams with Noopept. 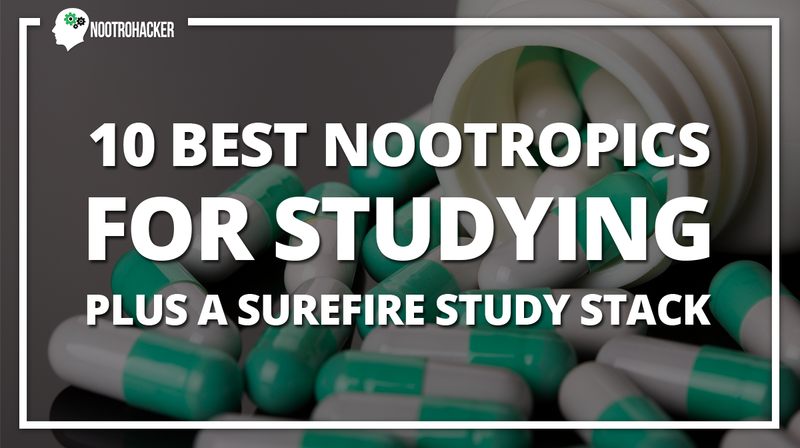 Noopept is an incredibly potent nootropic that has a mild psychostimulant effect, allowing you to study with laser focus. It offers similar effects as piracetam, but is a synthetic molecule and not actually a member of the racetam family. The recommended daily dosage for noopept is 10-30 mg. Take once a day and for no longer than 56 days at a time. Some users recommend cycling Noopept for best results, using it for 1-3 weeks and then taking one month off. Noopept is absorbed through the gastrointestinal (GI) tract, where it is then carried to the brain. It’s ability to cross the blood-brain barrier with ease means you will experience its effects quickly; as fast as 15-20 minutes after ingestion. This particular nootropic works by binding to specific receptor sites within the brain to inhibit the breakdown of glutamate. Glutamate is an essential neurotransmitter for healthy cognitive function, so you want to preserve it within the brain for increased focus and processing. In addition to preserving glutamate, Noopept brings more oxygen to the brain which not only improves your focus, but also elevates your mood. To use Noopept for studying, take 10-15 mg up to 3 times a day for cram sessions, however you should not exceed 40 mg within a 24 hour period. The ability to memorize and retain information is crucial, especially when preparing for exams. Pramiracetam is one of the most common nootropics used for improving memory and learning capacity, optimizing brain function, and enhancing your ability to focus. Potent on its own or coupled with others to enhance the effects of other nootropics. How much Pramiracetam should I take? The recommended dose of Pramiracetam is 300-600 mg daily, taken once or split into two doses. It generally works within 30 minutes of ingestion and has a relatively long half-life (4-6 hours), so if splitting doses, it is best to take it in the morning and then again in the early afternoon. Pramiracetam is a fat-soluble compound that is absorbed into the blood through fatty acids. Unlike most racetams which target specific neurotransmitters, Pramiracetam indirectly causes the release of acetylcholine by increasing high affinity choline uptake. As you may know, choline is a precursor to acetylcholine and responsible for forming long term memories, as well as improving learning speed and concentration. It does not seem to affect wakefulness or your emotional state, so when it comes to using pramiracetam for studying, you may want to couple it with an energy enhancer like adrafinil or oxiracetam. One of the best nootropics for improving your memory and enhancing neuroplasticity (ie. being able to understand the material you are studying) is Alpha GPC. Alpha GPC — glycerylphosphorylcholine or choline alfoscerate — is naturally present in our bodies in small quantities, but commercially manufactured in more concentrated doses to enhance your memory and reduce the effects of aging on the brain. How much Alpha GPC should I take? The recommended dose of Alpha GPC is 300-600 mg per day, however it is typically tolerated well by most healthy adults so the dosage range can widen. It has been found that taking between 300-1200 mg in one dose or split into two can be safe and effective. If you have never tried it before start at the lowest dosage and increase as deemed necessary over time. Alpha GPC’s structure naturally contains glycerol, phosphate and choline and is used by the body to store choline. It is water soluble and fast acting, meaning it crosses the blood-brain barrier with ease and users can feel the effects within an hour of ingesting it. After it has been absorbed and metabolized, the byproduct is a combination of choline and glycerophosphate, but its the additional choline that makes this nootropic so effective. As we’ve mentioned before, choline is essential for memory function and recall, as well as a whole host of other cognitive functions like concentration, focus and learning ability. When stacked with other nootropics, specifically those in the racetam family, it can make Alpha GPC for studying even more beneficial. If your morning cup of coffee just isn’t cutting it during study sessions then Adrafinil could help. Adrafinil — also known as Olmifon — is a nootropic compound typically used for its eugeroic effects. In other words, it is a wakefulness promoting supplement or stimulant. How much Adrafinil should I take? The recommended daily dose of Adrafinil is 150-300 mg. It is one of the more potent nootropics out there so it’s always best to start at the lowest dosage and give your body time to adjust before increasing. Cycling is also recommended. Try two weeks on, one week off, then go to one week on and two weeks off. This is not recommended for anyone who has issues with their liver as Adrafinil has been found to elevate certain enzymes which can actually cause liver damage. Adrafinil mimics the same response your body experiences during “fight or flight” mode. Though it is not completely understood how, it is believed that this nootropic increases the levels of Hypocretin — a neuropeptide that regulates wakefulness as well as arousal and appetite. It also affects your body’s levels of dopamine, norepinephrine and histamine, which all affect how alert you feel. To use Adrafinil for studying, stack with other nootropics including Sulbutiamine, Alpha GPC or Noopept for even more energy and alertness, plus improved attentiveness, memory and mental performance. When it comes to studying you likely want a nootropic for improving your alertness and making studying easier – like Bacopa Monniera. Bacopa Monniera is a natural nootropic that comes from the Ayurvedic herb water hyssop, and is used for its anti-fatigue properties and ability to improve alertness and wakefulness. How much Bacopa Monniera should I take? The recommended dose is 300 mg per day as long as the total active compound makes up 55% of the supplement by weight. If taken in leaf or powder form, the recommended dose is 750-1500 mg. It should be noted that if taken on its own, this nootropic takes several weeks to see improvements, as many as 8-12 weeks in fact. However, if you want to use bacopa monniera for studying and reap its benefits then you should stack it with phenylpiracetam, piracetam or one of the other racetams depending on your desired outcome (ie. physical energy, cognitive stimulation or reduced anxiety). How does Bacopa Monniera work? Bacopa Monniera improves synaptic communication by enhancing the growth of dendrites (brancehd nerve cell extensions) through which neural impulses travel. The better your neural impulse travel, the better your cognitive functioning and alertness. The active ingredient in this nootropic is Bacoside-A and is known for its ability to stimulate nerve cells, making synapses more welcoming to nerve impulses. Studying doesn’t come without a certain level of stress and anxiety, whether that be related to the act of studying or the outcome. To reduce your stress levels while studying or writing exams, test out Phenibut. Phenibut is a commonly used GABA-derivative nootropic that helps rid you of anxiety and improve your quality of sleep. Most often stacked with others for its mood boosting, stress-reducing qualities. How much Phenibut should I take? The recommended daily dosage of Phenibut is anywhere between 250-1000 mg. If you are a new user then you should start at the lowest possible dosage and allow your body time to adjust before increasing the amount taken. Highly effective, you do not want to take multiple doses as you should feel the effects of this nootropic all day long with just one dose. Phenibut is a derivative of the neurotransmitter GABA. GABA is responsible for reducing activity in the neurons that it binds to, leading to a calming, stress-reducing effect. Unlike GABA which cannot pass the blood brain barrier when taken in supplement form, Phenibut contains an additional phenyl ring molecule which allows it to cross this barrier with ease. There it binds to GABA receptors and lowers the level of excitatory action in the brain. To use Phenibut for studying, stack with Noopept for the ultimate memory boosting, cognition improving, increased wakefulness, but with a calm, anxiety-free effect. Looking for another anti-anxiety nootropic for studying? Try Picamilon. Picamilon, also known as nicotinyl-gamma-Aminobutyric acid, is another GABA-derivative nootropic, commonly used by college students to reduce anxiety and stress. It is considered very safe and has been well researched, and boasts very few (if any) negative side effects. How much Picamilon should I take? The recommended daily dosage of Picamilon is 50-300 mg. Most brands on the market it sell it in a 150 mg capsule, but you can also buy it in powder form and measure it out yourself. For best effects, many users prefer to split their dosage in two, taking one in the morning and another in the evening. Like most other nootropics, start with a lower dosage and increase over time as you deem necessary. Picamilon contains two natural anti-anxiety chemicals, GABA and niacin. As it passes through the blood brain barrier these two chemicals separate through a hydrolytic reaction. From there, GABA targets receptors in the central nervous system producing an anxiolytic response (ie. an anti-anxiety response) by preventing neuronal over-stimulation in your brain. Niacin, on the other hand, dilates blood vessels in your brain resulting in more oxygen to the brain, improved cerebral blood flow and increased glucose metabolism. In essence it improves the health of your brain neurons. To benefit from Picamilon for studying, stack it with racetams like Piracetam or Aniracetam for a more positive and effective studying session. This stack is most effective when taken before an exam for study purposes or during exams as well. I wouldn’t recommend taking it daily as you’ll start to see a lesser effect over time. Benefits: Consider this as the “mood enhancer” in the stack as it has a direct impact on increasing dopamine levels. It has a rather nice anxiolytic effect which will help reduce unwanted stress during exams or in the lead up to them. Benefits: Oxiracetam can be considered a mild stimulant when compared to aniracetam. It’s basically a powerful antioxidant, helping to remove excess toxins like calcium, which can lead to a drop in memory function in the brain. Benefits: Noopept is regarded as one of the most well known nootropics on the market today. It aids in improving cognitive and learning functions much like most racetams, however with a faster absorption rate. Benefits: CILTEP is your all out performance enhancer. It contains 3 main components: artichoke extract (900mg) for learning and memory, ALCAR (750mg) for combatting brain fatigue and LPhenylalanine (500mg) to help increase dopamine metabolism. Out of all the brands of premade stacks, this one is most likely to help for studying purposes.